The lyrical video of the song Thandaane Thandaane from Ram Charan's Vinaya Vidheya Rama has received 2,804,525 views and 108,000 in two days. 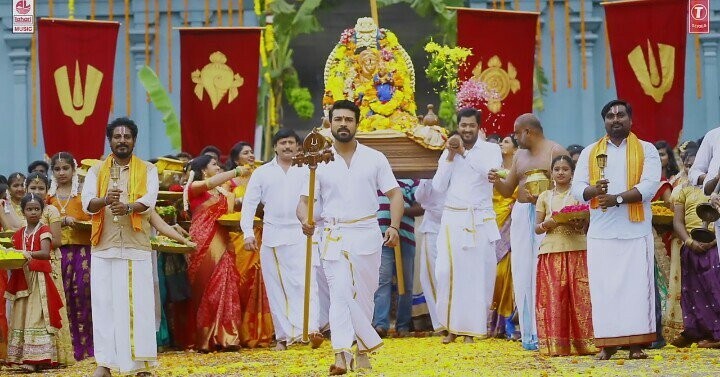 The lyrical video of the song Thandaane Thandaane from Ram Charan's Vinaya Vidheya Rama has impressed music lovers and has received a positive response from fans all over. Vinaya Vidheya Rama is one of the most awaited Telugu movies this year. Producers recently released its teaser, which has impressed viewers greatly and many fans of the mega family were excited to listen to its songs. Makers of the film announced that they would release the first single at 4.00 pm on December 3. T-Series Telugu released Thandaane Thandaane on its YouTube channel. Devi Sri Prasad shared the link and wrote, "Hope U all love this song!!! #VVRFirstSingle #ThandaaneThandaane #VinayaVideyaRama Amazing Lyrics by @ShreeLyricist and Soulful Singing by @MlrKarthikeyan Also Thanx 2 all d lovely Musicians n my Tech Team ! Dedicated to all Lovely Families ! !❤️❤️ (sic)"
The song Thandaane Thandaane speaks of how happiness is achieved by being content with what you have, living with freedom and liberty while prioritising family. Its beautiful lyrics, melodious music and soulful singing have struck a chord with music lovers and many of them shared their reviews on Twitter. The lyrical video of the song Thandaane Thandaane went on to cross 2 million views in 24 hours. DVV Entertainment tweeted, "2 Million+ Views for #ThandaaneThandaane Lyrical Video. Thank you all for the wonderful response :) #VinayaVidheyaRama #RamCharan @Advani_Kiara @vivekoberoi @LahariMusic A Rockstar @ThisisDSP Musical... A Boyapati Sreenu Film... @DVVMovies (sic)"
The soundtrack Thandaane Thandaane has received 2,804,525 views and 108,000 in two days. However, T-Series Telugu boasts of 2,057,449 subscribers on its YouTube channel. After seeing these numbers some feel that the movie has failed to create the expected amount of buzz in social media.